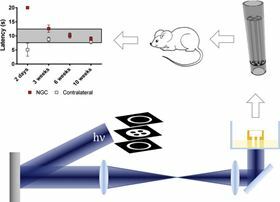 Schematic of the rapid continuous 3D-printing system for printing customizable NGCs. (a) Various NGC CAD designs (left column) and the corresponding 3D-printed NGCs (right column). (b) 3D-printed human life-size NGC; the facial nerve schematic on top was adapted from Atlas of Human Anatomy (p. 124, 6th Ed. ), by F. H. Netter, 2014, Philadelphia, PA: Saunders. Copyright 2014 by Saunders, an imprint of Elsevier. Researchers from the University of California San Diego have developed a fast, continuous means of producing nerve guidance conduits (NGCs) that could help in the treatment of peripheral nervous systems injuries affecting half a million people a year in the USA and Europe [Zhu et al., Materials Today (2018), https://doi.org/10.1016/j.mattod.2018.04.001]. Nerve damage arising from injury or illness is typically treated in one of two ways, depending on its extent. Short gaps can be repaired by suturing the separated nerve endings back together, without introducing any tension. More severe damage requires nerve grafts – from either another part of the body or a cadaver. Autologous nerve grafts or autografts are the ‘gold standard’, but can leave loss of function at the donor location or not fit the injury site perfectly. An alternative strategy is to use NGCs – tubular structures engineered from biocompatible polymeric materials – to bridge the gap between severed nerve endings and act as a guide for regenerating nerve cells, while offering protection from in-growing scar tissue. Currently, NGCs are relatively simple – straight, hollow conduits made from a handful of suitable materials. “There remains an unmet need for a manufacturing technique that can fabricate designer scaffolds with superior resolution, speed, flexibility, and scalability so that customized NGCs with specified diameters and complex architectures (such as branches) can be created for regeneration of more complicated nerve gaps,” explains Shaochen Chen, who led the work. The team believes that they have met this need with their 3D-printing platform, which can produce customizable NGCs rapidly and continuously with better resolution and more scalability and flexibility than current biofabrication techniques. Their approach uses a digital light processing (DLP) 3D printing platform employing a digital micromirror device (DMD). “Each DMD chip simultaneously projects millions of spots of light for massively parallel photo-polymerization to form a 3D structure, which is much faster than traditional point-by-point 3D printing,” explains Chen. Because the technique is digitized, computer-aided design (CAD) models, computed tomography (CT), or magnetic resonance imaging (MRI) scans can be used to produce specific NGC designs. Moreover, their mechanical properties can be fine-tuned by varying the light intensity and exposure time. The constructs are also smoother, with fewer defects than produced by other print-based techniques, which further improves the structural integrity. 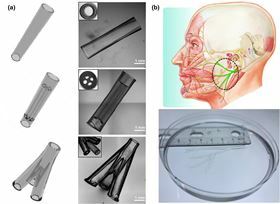 Using photo-polymerizable biomaterials, gelatin methacrylate (GelMA) and poly(ethylene glycol) diacrylate (PEGDA), the researchers printed simple hollow conduits, multiple microchannels, branched structures, and even an anatomically-sized biomimetic NGC that could be used in the future for human facial nerve repair, but other materials could also be used. “Our approach has the potential to combine with stem cell technology and growth factors to further improve nerve regeneration and achieve better functional outcomes,” says Chen.